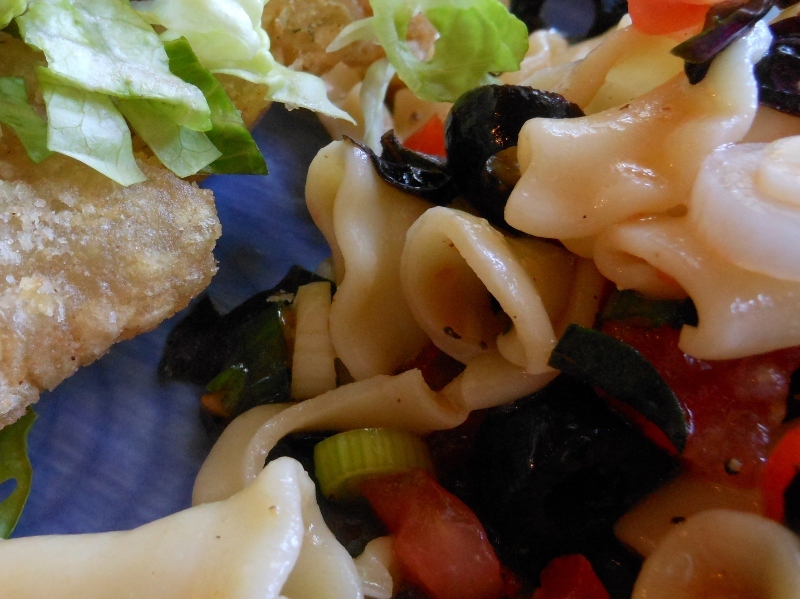 Just a quick post today for some delicious fried oysters. We used the tub of oysters found at the grocery around Thanksgiving. I am sure they would be better if they were fresh from the ocean but it’s hard to come across those here in the midwest. Heat a good amount of oil over medium heat in large skillet. Combine flour with desired seasoning. Drain and rinse oysters; toss with flour. Fry for about 3 minutes; flip and fry about 3 more minutes or until golden and cooked as desired. 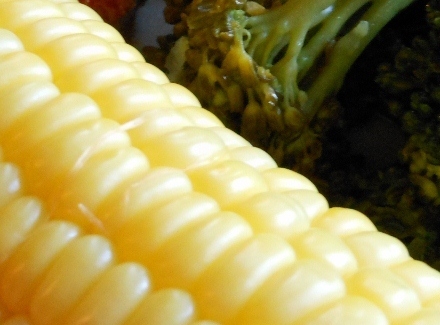 There isn’t much better than fresh from the garden corn on the cob this time of year. It really is best freshly picked or at least eaten within a few hours of picking. Setting even overnight diminished the flavor which is why that corn on the cob from the grocery store never really hits the spot. Around here a variety called Incredible is the best most versatile type. 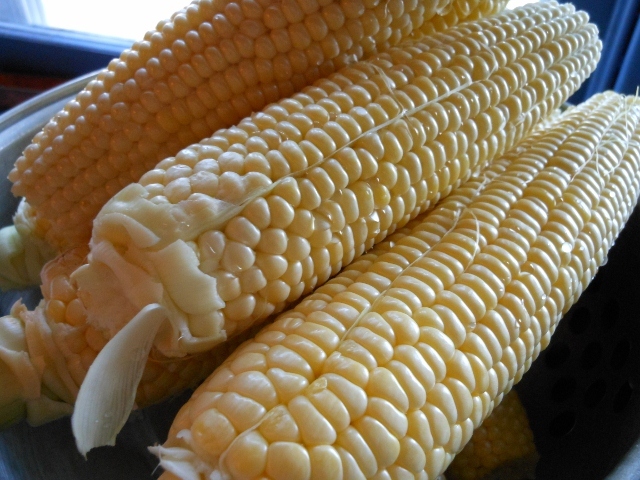 It is sweet and delicious fresh and also freezes well cut of the cob for great corn all winter long if you are lucky enough to have some left. There are some other great varieties too but this one is alway good. I’ve found a couple of ways to cook it that we really enjoy. First is the old water bath like mom used to do. It is quick and easy and gets great consistent results. Bring a large pot of water to boil. Place as many ears in pan as you can comfortably fit and cover with water and bring pot back to a boil about 3 minutes. We used to cook it 5 minutes once we placed the corn in the pot but really I think just returning to a boil and maybe a few more seconds does the trick beautifully. The newest way I’ve discovered to cook it is to grill it. 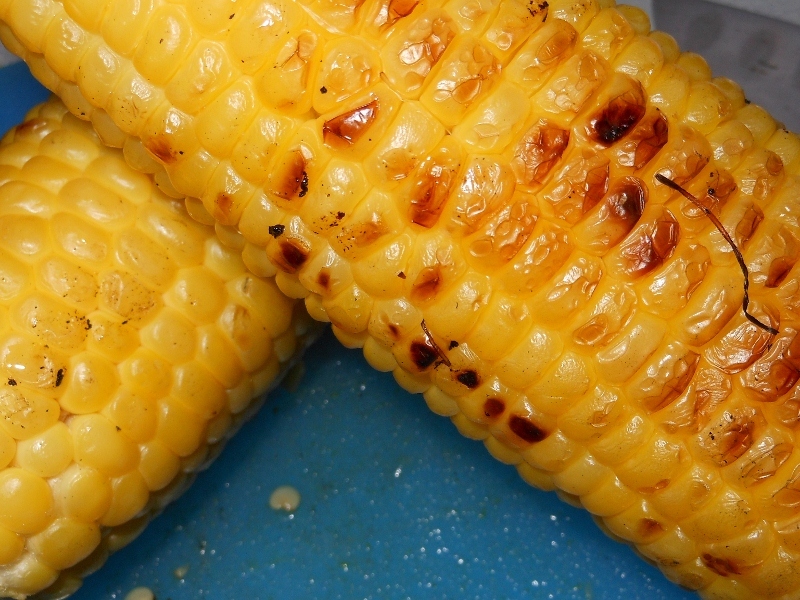 Now I’ve seen all the techniques of leaving the husks on, pulling out the silks, soaking in water ….. but I’ve found shucking the corn and rinsing off then grilling over hot coals for about 10 minutes gets the corn nicely cooked and the sugars evolve in a way you really don’t even need butter. 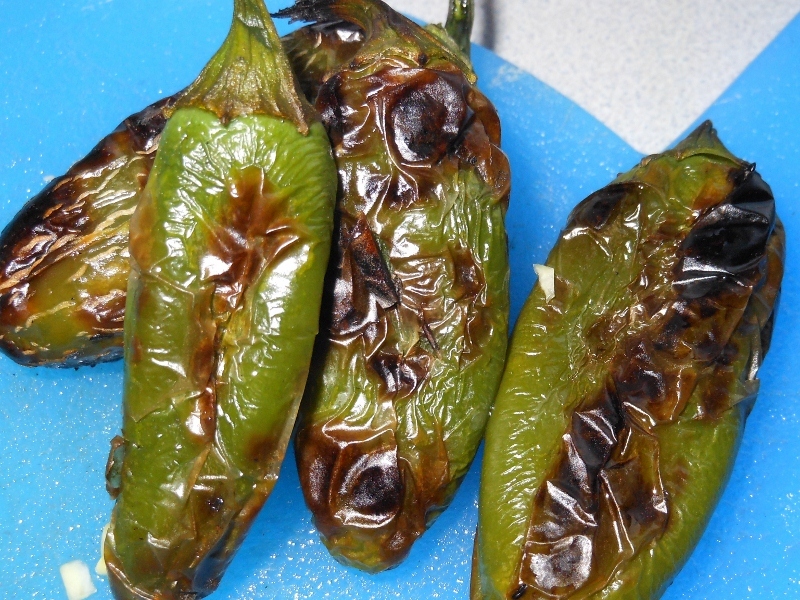 It will however need to “steam” for a few minutes so I like to place mine into a gallon plastic bag or a covered bowl for 3 – 4 minutes before serving to really bring out the flavors and equalize the heat. I was doing a little experiment today and I think Charles will be requesting these once he reads my post. Our schedules conflict a bit on weekends so sometimes I am left to try new dishes all by myself. 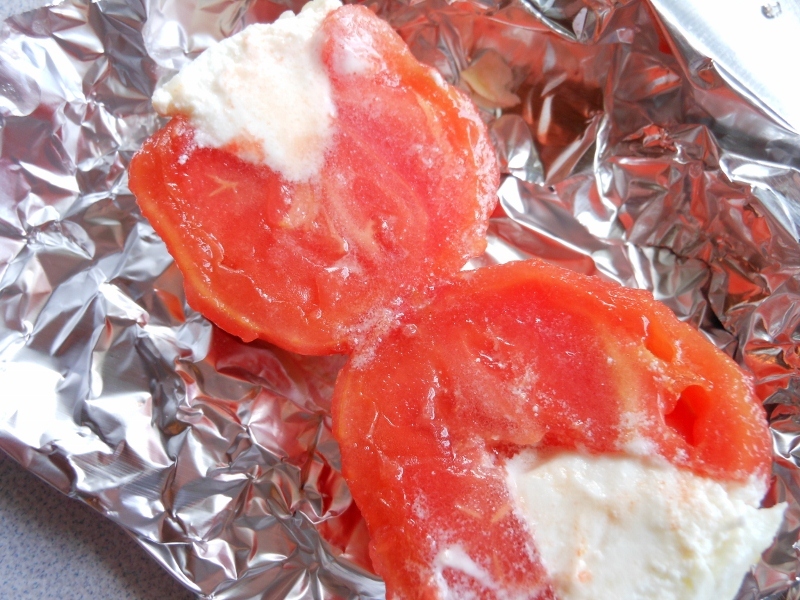 I love goat cheese if you haven’t noticed and I finally have gotten some tomatoes from my garden so I couldn’t resist putting the two together. Ok, so this is ridiculously simple. Generously trim core from tomato making a cut out cone shape. 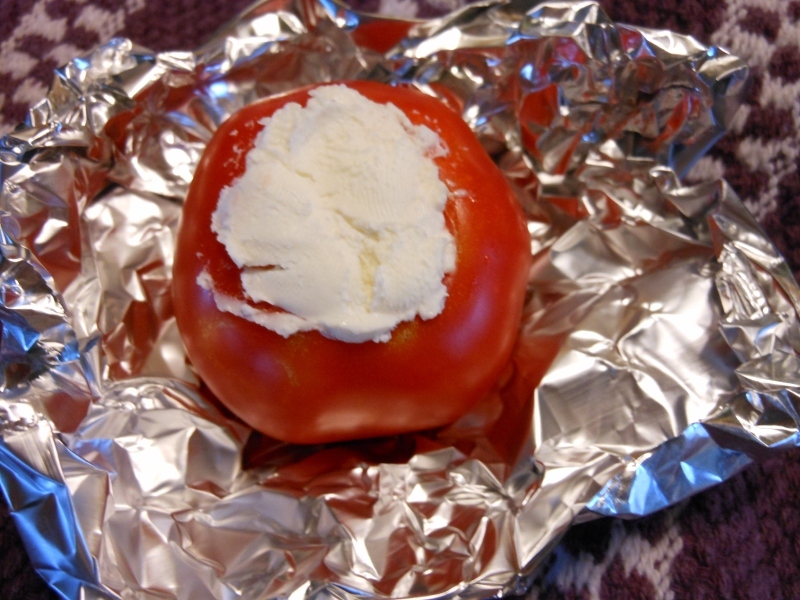 Fill with goat cheese; I left mine plain but you can add herbs such as basil if desired. 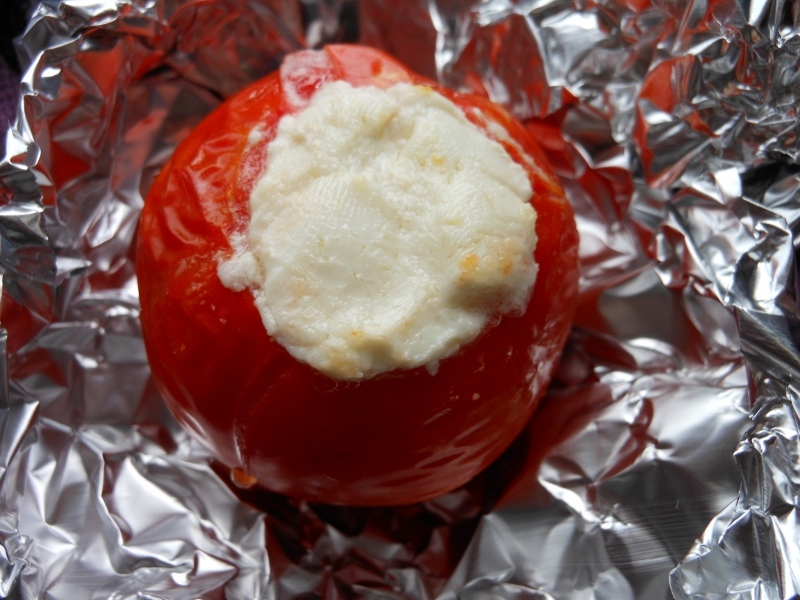 Broil for about 8 minutes or until skin begins to blister. This last picture isn’t great but I wanted to show how it looked from the inside. 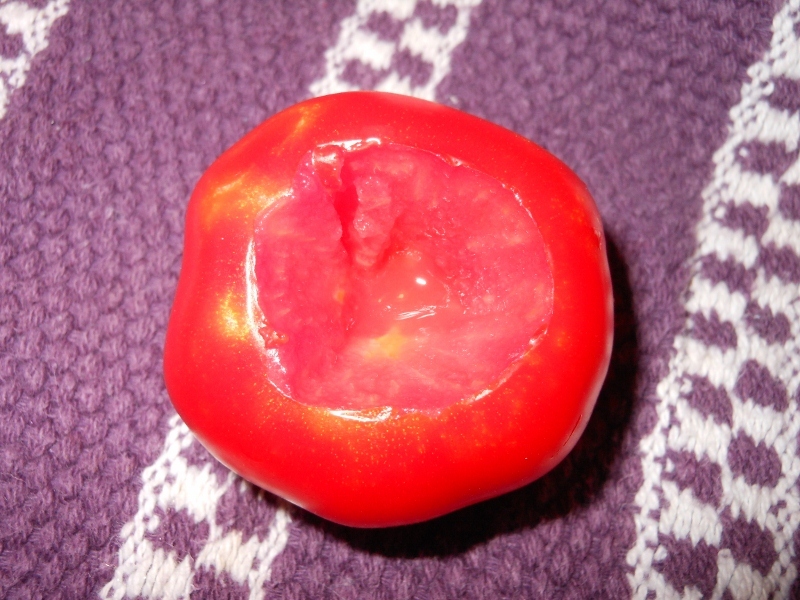 I pulled the skin off which didn’t make for the prettiest tomato but so easy to eat. 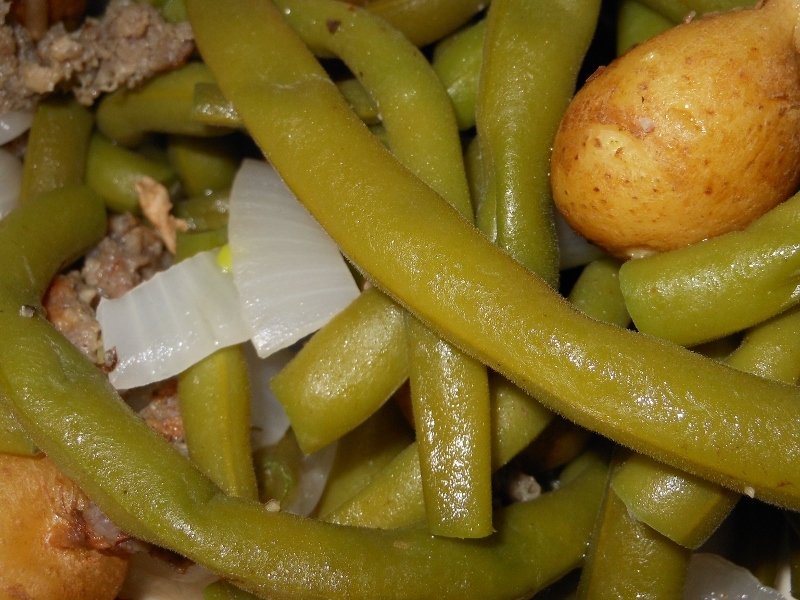 Just a quick post today about the green beans I made last night with our meatloaf. I’d bought these at the farmers market a couple of days earlier and didn’t have a chance to cook them right away. I decided to do a bit of a sauté / steam method. 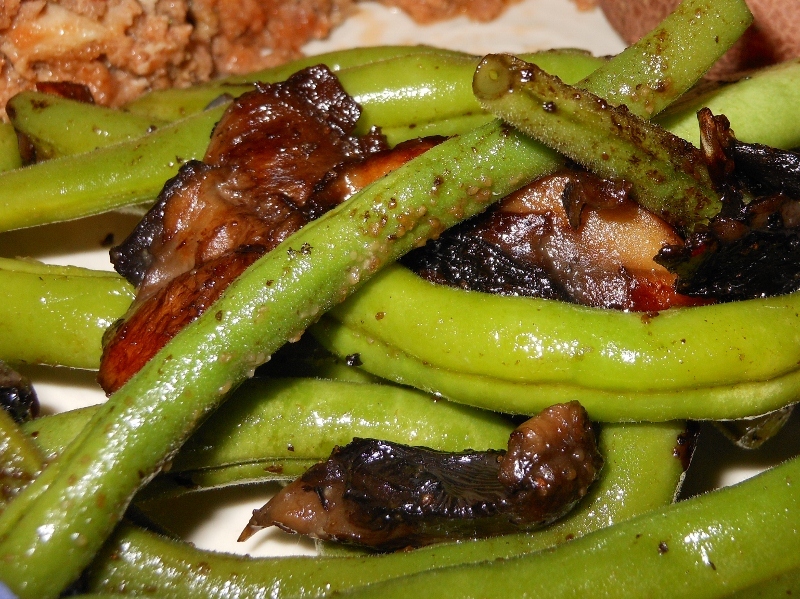 Very tasty; still very crisp and the full flavor of fresh green beans. As a kid I didn’t like that taste but I do so enjoy it now. The mushrooms were the perfect complement. Wash and trim green beans. 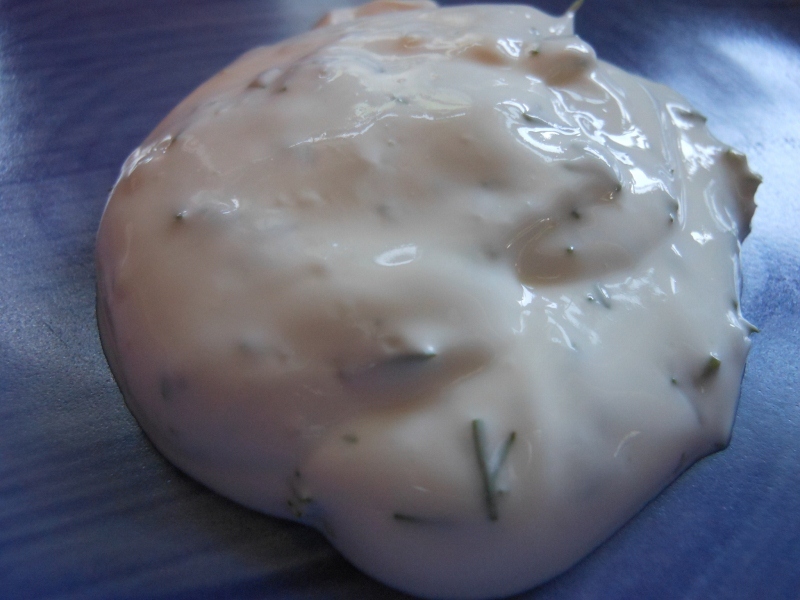 In medium skillet melt butter and add mushroom cut into large chunks. 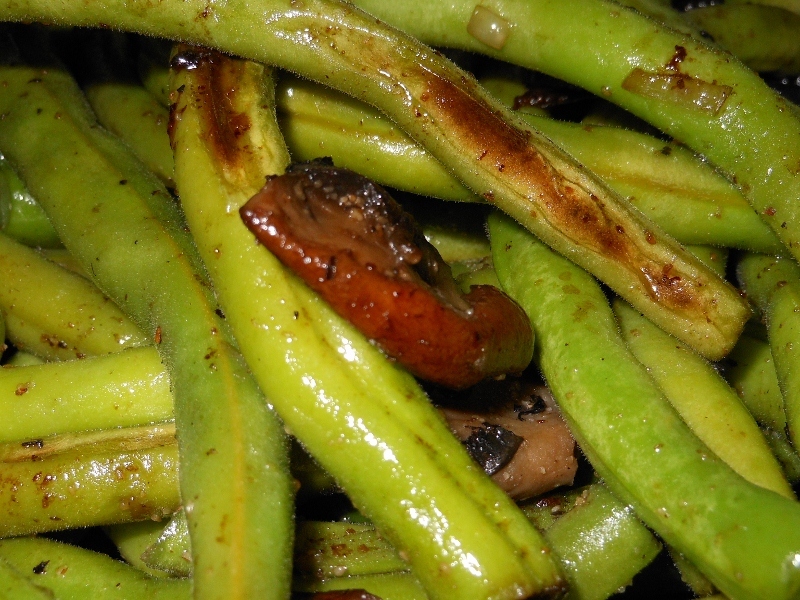 Add green beans and cover; cook for 5 minutes over medium heat. Season with salt, pepper and garlic if desired; stir and cover; cook an additional 5 minutes or until desired tenderness. 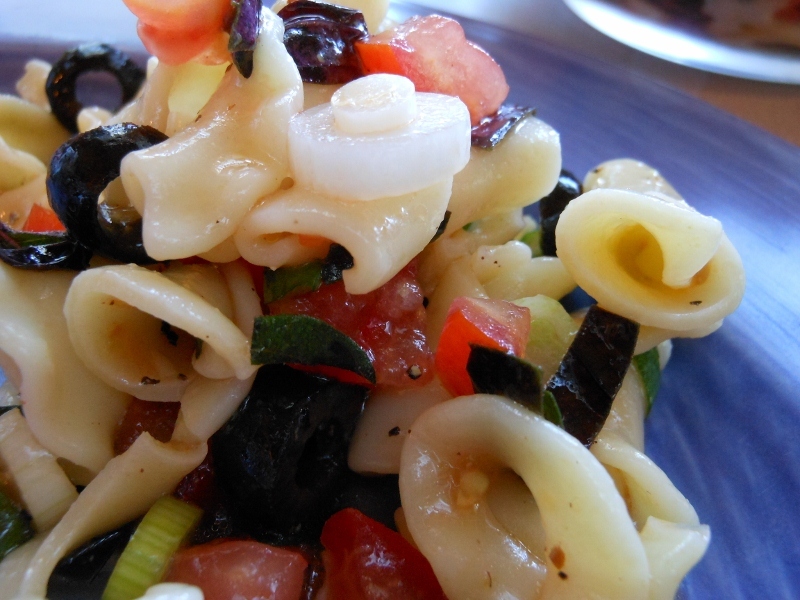 Another quick post today; this would be another of my pasta and goat cheese recipes but I did take a slightly different and fresh approach to it. I used a bruschetta type combination for the sauce; a fresh basil, tomato, and olive oil. 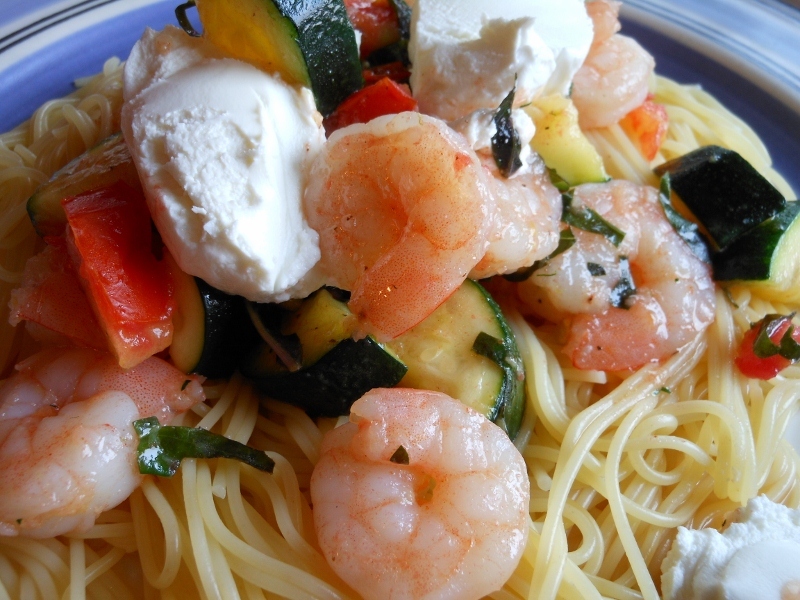 I also paired zucchini with the shrimp for a nice vegetable addition. Prepare pasta according to package directions or desired technique. 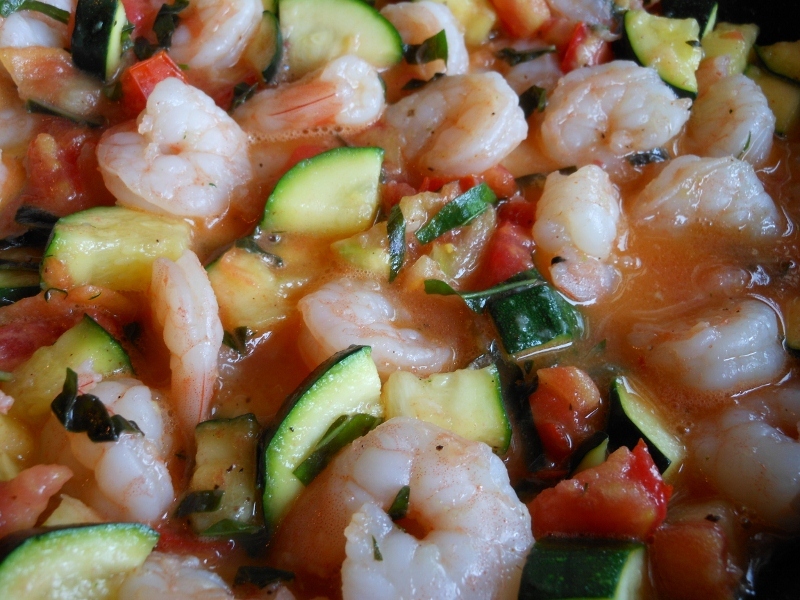 In large skillet melt butter; add shrimp and zucchini; sauté about 5 minutes or until shrimp is just cooked. Meanwhile combine olive oil, basil and tomato. 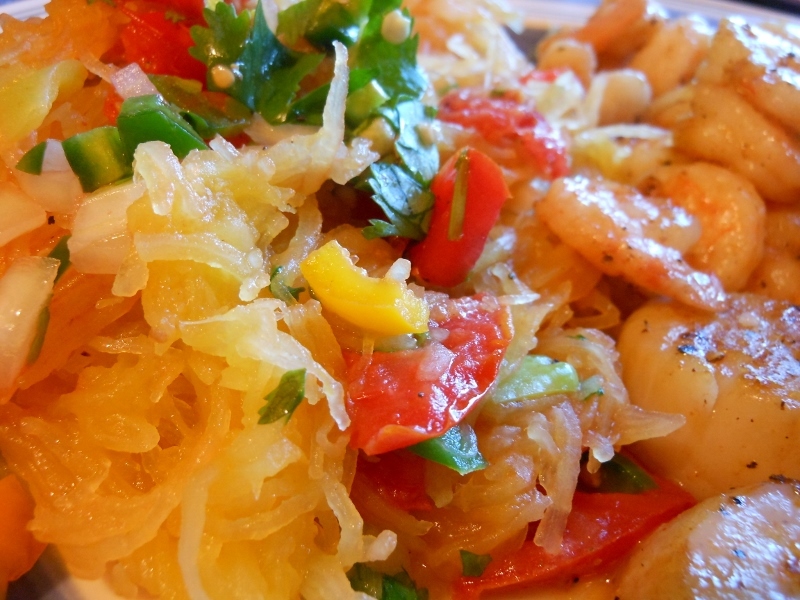 Once shrimp has cooked add tomato mixture and heat through about 1 – 2 minutes. Serve over pasta and add goat cheese or parmesan if desired. 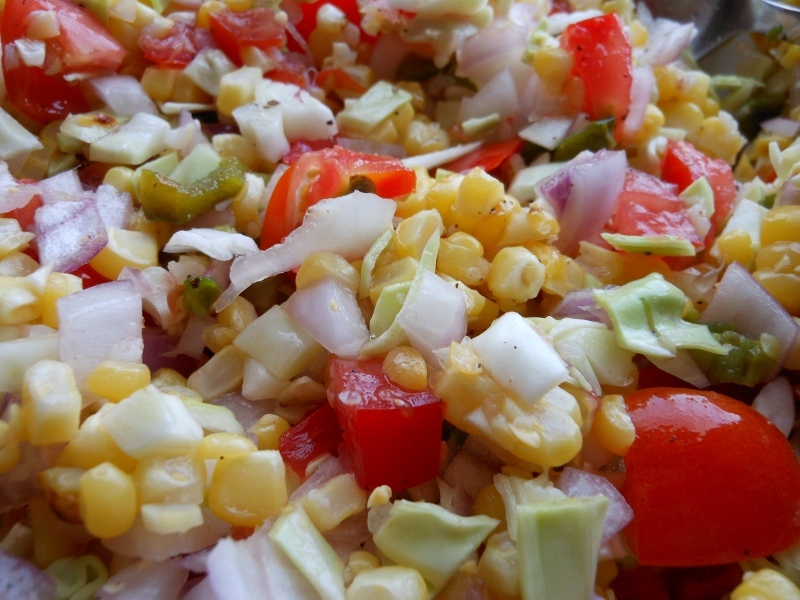 I made the most delicious fresh corn salad today. 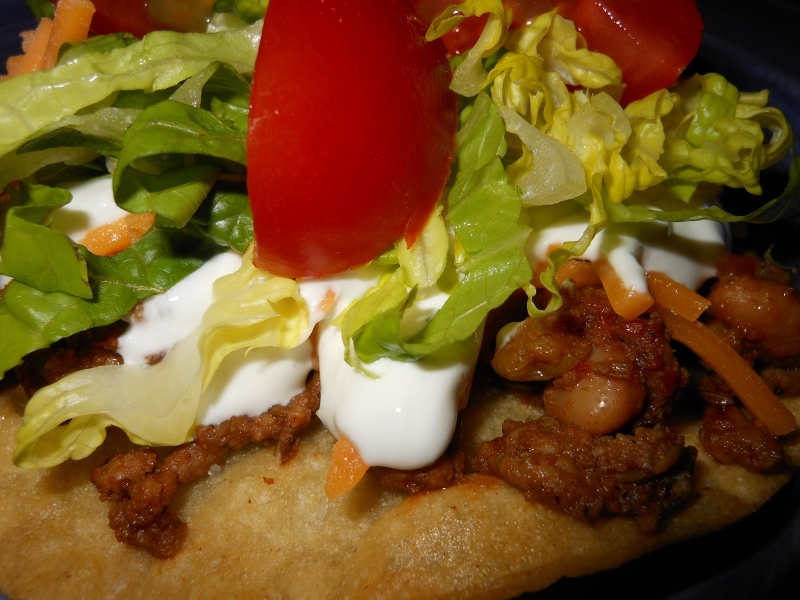 I served it with some slow smoked pork and fresh fried corn tortillas along with some cheese, sour cream and avocado. Everything but the black pepper and the lime came from the farmers market or my garden. Oh so deliciously fresh. 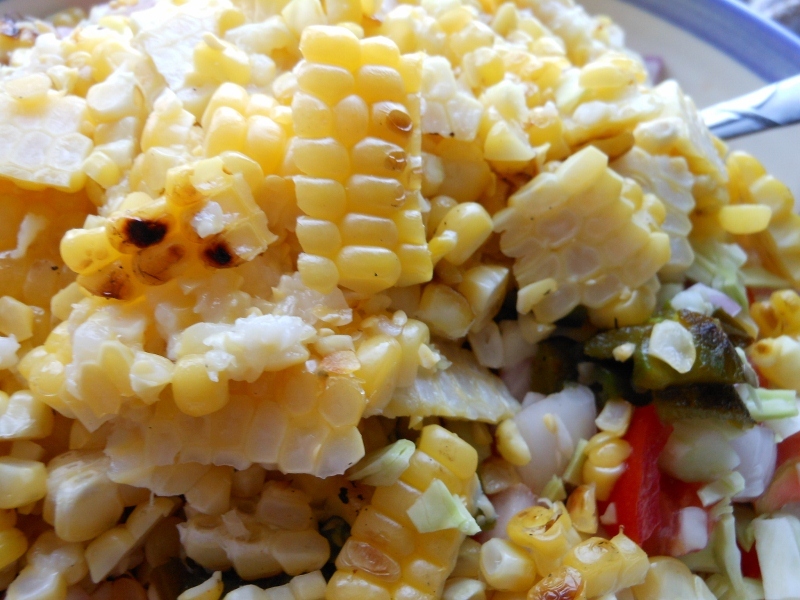 I roasted the corn and jalapeno and it brought out a terrific flavor and the cabbage adds a great crunch. 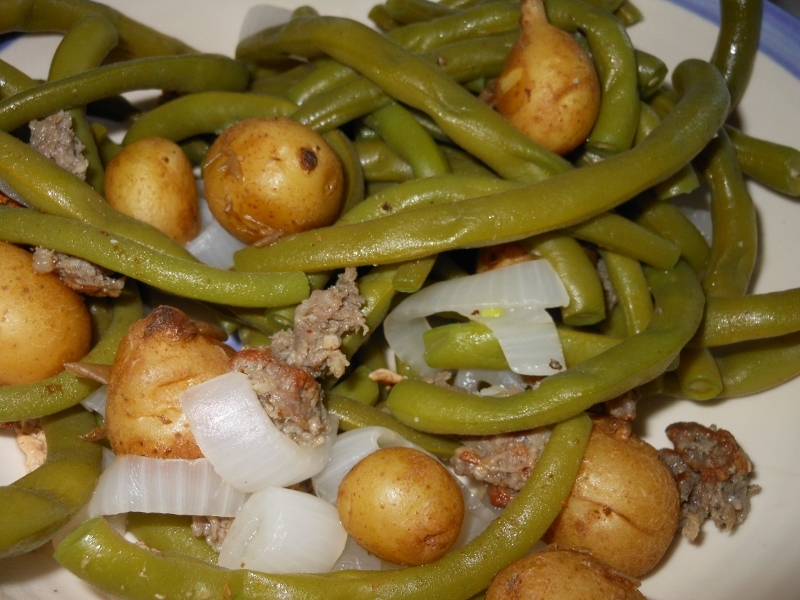 It was even delicious by the spoonful as a stand alone side dish. Over hot coals roast shucked corn for about 10 minutes and jalapeno for about 8. 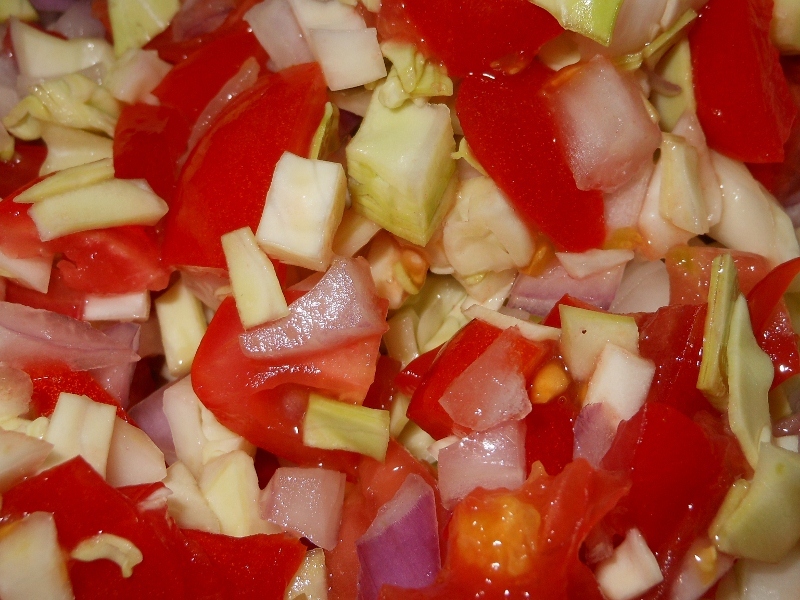 Turn frequently and put each into a plastic bag when finished and allow to rest for 5 minute before proceeding. Meanwhile dice tomato, cabbage, and onion. 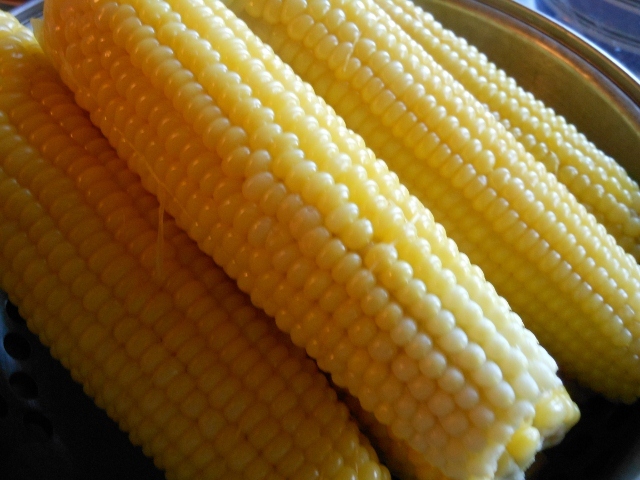 Peel jalapeno and cut corn from cobs. Stir together and add lime juice and pepper to taste. I do hope no one is getting sick of my fresh basil posts. My herbs are growing like crazy (despite this dry, dry weather we are having) so I am trying out new things all of the time. I seem to be on a bit of a basil kick, but it is so good! I am addicted to the purple basil; it’s flavor is full but perfectly sweet. I try to use a mix of the varieties when I make a recipe so any type will do. I threw this together with some pasta I had left over from my past couple of recipes, and I couldn’t resist adding a few black olives for that tangy touch. Cook pasta according to package directions. Rinse and chill; drain well. Prep basil by tossing with a little olive oil and slicing into thin strips ~ check out my fresh basil post for an easy technique. Mix together pasta, olive oil, vinegar, sugar, basil, and olive. Dice tomato and thinly slice green onion; add salt and pepper to taste. I decided tostadas sounded good for dinner Sunday after a busy day. I cooked some ground beef and seasoned with my taco seasoning recipe. I only wish I’d had some jalapeno on hand to make some Pico de Gallo to top it off, but alas I did not so I opted to infuse some extra flavor into the sour cream with some fresh lime and cilantro. I liked the freshness it added putting the cilantro in the sour cream and the lime of course was a perfect touch. 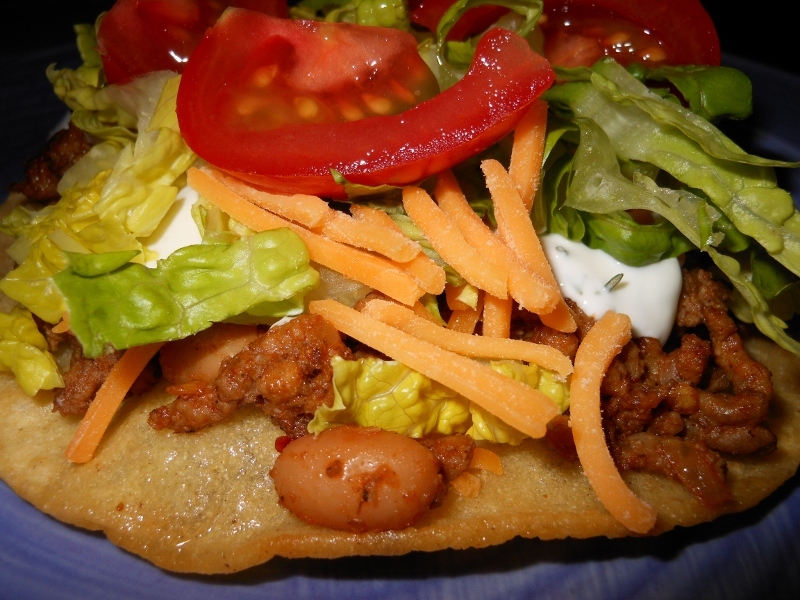 I layered my fried and baked corn shells with the meat and bean combination, shredded cheese, cilantro lime sour cream, lettuce and tomato. Avocados would be delicious too but I was working with what I had in the house so top yours as desired! Mix together sour cream, cilantro and lime. Refrigerate until ready to use.